The word ‘epic’ is often abused, in fact it’s been quoted as being the most overused word ever, along with the word ‘fail’. So I’m going to use it appropriately today to introduce you to something… well, epic. 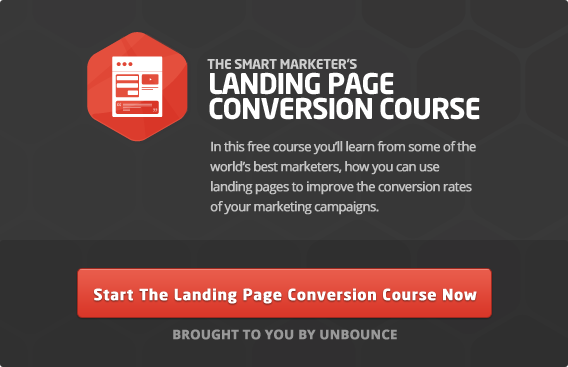 Let’s see if The Smart Marketer’s Landing Page Conversion Course fits the bill. 11 episodes – each will take you 30 minutes or less. 9 most excellent instructional videos. 21,417 words, but who’s counting. A worldwide community of internet marketers just like you, to discuss, share, and learn alongside. 0 cost. Yup, we’re not charging anything for it. That’s not how we roll. If you’re reading this, then you’re probably interested in getting more success from your marketing. That’s what the course is all about. Giving marketers access to the best insights on how landing pages can improve your conversion rates. You might know that you should be using landing pages, but might not know the best way to go about it. And the landing page conversion course is the perfect way to take you from zero to hero in a few weeks. What’s in this free course? In this 11-part course landing page expert Oli Gardner (that’s me!) will walk you through everything you need to know to create high-converting landing pages. The course includes step-by-step instructional videos so that you can follow along, creating your own landing pages as you go. Along the way, you’ll find expert tips and advice from some of the best online marketers around (see below), and countless examples of how to create marketing campaigns that convert. Learn why you should never start a marketing campaign without a dedicated landing page. Get the blueprint for the perfect landing page, and find out how to create a great page using the 5 core elements. How you design your call-to-action, and where you put it on the page can have a big impact on your campaign success. Almost every marketer wants to capture more leads. Learn how to design lead forms that convert. Learn effective techniques for writing great headlines, calls to action, benefit statements and more. 4 classic design principles are examined to show how you can design your landing page for conversion. Understand how to use simple marketing psychology to make your landing pages convert more prospects into leads. We’ll teach you how to keep marketing to your leads even after they have converted! Master the process of landing page optimization and start running your own A/B tests. Learn the economics of conversion so you can show anyone how to effectively communicate the value of optimization. Get inspired by this collection of beautiful landing page designs. Each one critiqued for conversion so you can learn from the best. We’ve gathered some of the smartest minds in the business to share their knowledge and advice, so you can get a wide range of perspectives and more importantly, learn from the best in the biz. Check out the list below. Want to be part of something epic? Start The Smart Marketers Landing Page Conversion Course today. Join your fellow marketers. Learn from them. Teach them some tricks, and in a month from now, we’ll all be smarter marketers.